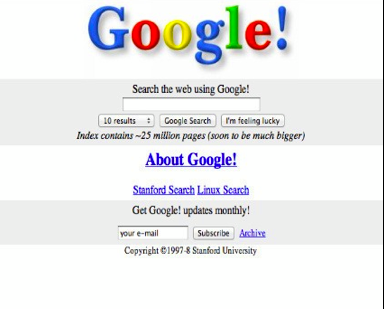 It’s amazing to think that less than 15 years ago Google looked like the above image. It was just a college project that was more or less started by two guys. The story from tiny college project to search giant is truly an amazing story of two american’s really going at it and building the company of their dreams. Today Google is in many markets from software to phones. Google even has an investment wing where they will invest money in certain projects. Notably they gave over $250 million to Uber recently.